Cook and shred the chicken. I cooked mine in the slow cooker with the ranch packet and taco seasoning packages in the chicken broth. I cooked it on low for about 3-4 hours. Mix the ranch and salsa in a bowl. Spread a very thin layer of the mixture on the bottom of a 9 x 13 baking dish. 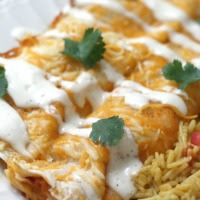 Start assembling the enchiladas by putting 2 Tbs of the ranch and salsa mixture on the bottom of tortilla. Then put the shredded chicken on top of that. Sprinkle with cheese and roll it up. Line up the enchiladas in the 9 x 13 pan and spread the remaining ranch/salsa mixture on top of the tortillas before sprinkling heavily with cheddar cheese. Bake at 350 degrees for 30 minutes or until the cheese is bubbling and enchiladas are heated through. Drizzle the top with ranch.